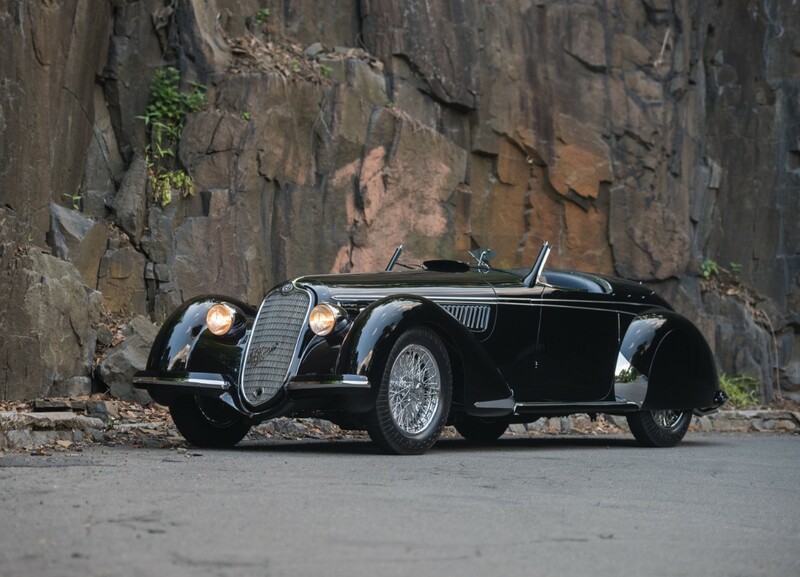 The Alfa Romeo 8C was Alfa’s largest, most powerful, pre-war road car. It was available from 1931 through 1939 and came in a few different models, beginning with the 8C 2300 and culminating in the 8C 2900B. They were powerful, fast, and sporty. In fact, RM says that it was sportiest car money could buy in 1939 – on par or above the Bugatti Atlantic. This car is powered by a 180 horsepower, supercharged 2.9-liter straight-eight – enough to allow this car to cruise along at over 100 mph all day long. The Carrozzeria Touring-built body is aluminium and it is beautiful. This is a “Lungo” 8C, meaning it has the longer of the two wheelbases offered. The earliest known history of this car goes back to 1949, when it was racing in Brazil. The body was separated from the chassis and for the next few decades they remained apart in hands of separate owners. By some miracle, they were reunited in Switzerland in the early 1990s. The restoration was completed by the end of 1997 and, remarkably, the current owners have driven more than 12,000 miles in this car – which is a huge number for a car this rare and valuable. Only 32 8C 2900 chassis were built and twelve of those are Touring Spiders. Of the 12, only seven are on the long-wheelbase chassis. This is where it gets even more mind-blowing: the pre-sale estimate is between $20,000,000-$25,000,000. Incredible all around. Click here for more info and here for more from RM Sotheby’s. 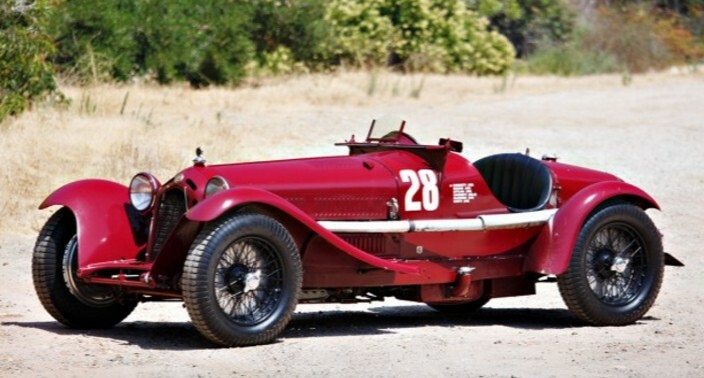 The 8C 2300 was the initial Alfa Romeo 8C offered and it was introduced in 1931. It was a sports car, through and through, and they were raced heavily in their day – both by the factory and privateers and winning Le Mans four times (in a row!). 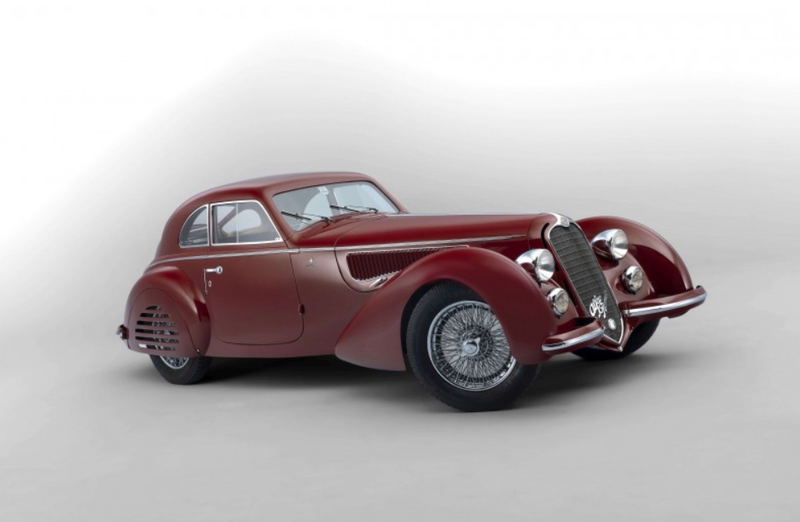 The 8C 2300 Monza is a short-chassis model based on a car Alfa ran at Monza in 1931 (basically they just cut some length out of a Spider chassis and put the exhaust down the side of the car). The first Monzas were just shortened Spiders, but for 1932 and 1933, the Monza was a model unto itself. Alfa didn’t build many, but race teams – like Scuderia Ferrari – converted some Spiders into Monzas. And what we have here is an actual, Alfa Romeo factory-built 8C 2300 Monza. It carries a Brianza-built body and was sold new in Italy. It is one of the last Series 3 Monzas built and is powered by a supercharged 2.9-liter straight-eight making in excess of 180 horsepower (when new, it would’ve have a 2.3-liter engine). Only about 190 8C 2300s were built and very few were factory-build Monzas. This one should bring between $12,000,000-$15,000,000. Click here for more info and here for more from Gooding & Company.